From Fat to Fit Chick: : A new year...new goals! Eh, what ever works right? I'm just going to list everything I want to do in 2013 lol These are big and small combined. I usually just check them off as I go. One of those will be a half marathon...so I can finally put my 13.1 sticker on my Jeep. Yes, that is why. Get to an Autism Support group with my husband because I have a feeling the older my son gets, the harder it is going to be. Just keep on enjoying life! The key is to make goals just out of your reach but be realistic about them. Unrealistic would be something like: I am going to lose 200 pounds in 6 months. Remember you are setting yourself up for success and time based goals aren't the best idea unless you can take a failure without it going to heart. Love your goals! Im on a health and fitness journey as well, you look great by the way! Love your goals!! Mine are to get a workout in at least 4 days a week, double my Mary Kay business, and use more positive words and thinking throughout my day. So happy for you that you are being recognized for your success and that you are continuing to inspire others to get healthy! I have lost 189 pounds and at the age of 51 am finally the healthy person I always knew I had inside of me! It was a long and bumpy road but I did it and anyone can if they put their mind to it. I am now going to get my lifetime in a few weeks with Weight Watchers and then will begin my training to become a Weight Watcher Leader and inspire others! I have already inspired so many in my small little town of Croswell, MI and I hope to continue to do so. 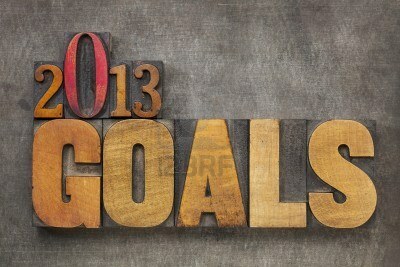 My goal for 2013 is to help just one person to change their life and get healthy, active and happy to be alive!